Act Fast! The first 8 people to follow and send a private message (with your snail mail address) to FastFoodNews via Twitter will get a pair of McDonald's "Be Our Guest Cards." Each card can be redeemed for a free Angus Third Pounder. (These cards were supplied to Fast Food News by McDonald's Inc.) We've given away the free Angus Third Pounder cards, but you can still follow FastFoodNews on Twitter. Yesterday was the first day for McDonald's first nationwide roll-out of a new burger in 8 years, the Angus Third Pounder. These burgers are more substantial than the Quarter Pounder. The beef patty is clearly bigger, although it still has that iconic, pre-formed appearance of all McDonald's meat patties. The real rings of purple onion and the thick slice of a large diameter tomato are nice touches. It helps to push this burgers taste in the direction of a home made hamburger... not that it actually makes it to that realm, but it helps. The lettuce was abundant, fresh and of good quality, too. We both noticed, though, that the purple onions were virtually tasteless. We assume that McDonald's went to great lengths to find onions that would never be considered to strong or offensive. We had fun imagining the process of McDonald's execs insisting on a genetically-modified scentless, tasteless onion that could be grown in huge quantities. Just a fantasy; couldn't be true. 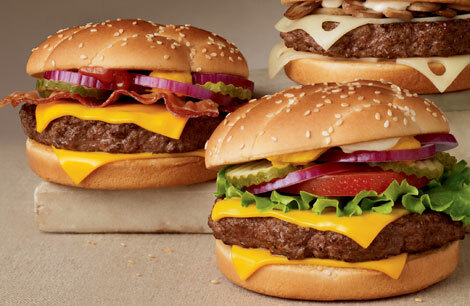 In the press materials for the Third Pounders, the descriptions of all 3 burgers ends with, "served on a toasted bakery-style sesame seed roll." This description left me expecting the burger to be on a warm, slightly crunchy, toasted bun. This was not the case. The bun was cold and soft and had not been toasted in any way noticeable from the outside. When I took the burger apart for the photos below, I could see the the inside of the buns had been toasted slightly. No big deal really, but after reading the description I suppose I became hopeful that the entire sandwich would be run through a warmer/toaster just before being served. 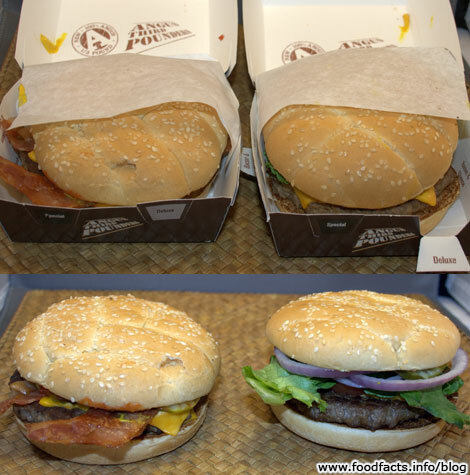 Otherwise, besides being a little bigger, the buns do not differ in consitency or flavor from standard McDonald's buns. 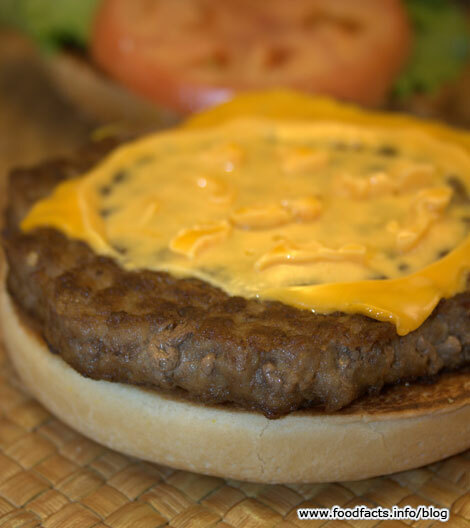 The Angus Third Pounders have a calorie range of 750 to 770 calories. 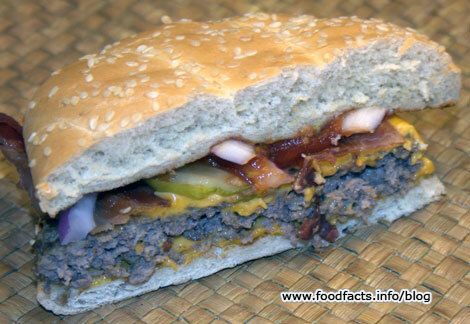 They have 39-40 grams of fat and 16-17 grams of saturated fat. Interestingly, they also have 2 grams of Trans Fat. This is interesting because most fast food chains have eliminated or are attempting to eliminate all trans fats from their menus. A reader asked if this would prevent the sandwiches from being sold in New York City where Trans Fats are banned. I, in turn, asked a McDonald's rep and was informed that, "NYC Department of Health regulation pertains only to artificial trans fat. 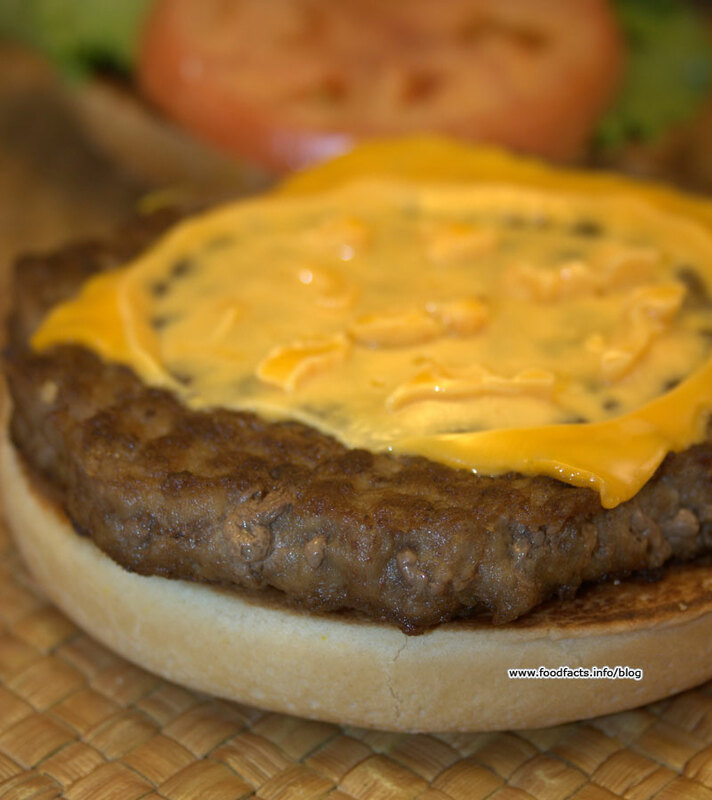 The 2 grams of trans fat in the Angus Burger is attributed to the beef patty that contains naturally-occurring trans fat,a type of trans fat that would not be subject to the artificial trans fat regulation." Had one yourself? Let us know what you think. 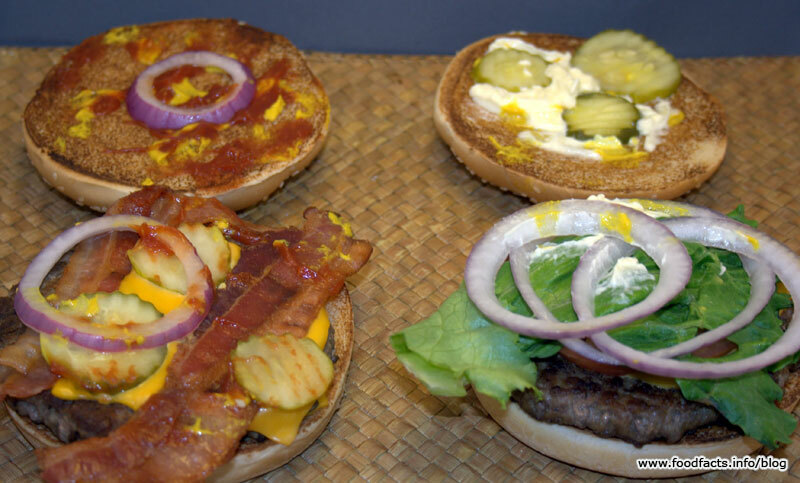 Yet another McDonald's burger I won't be trying. Why do they insist on taking a perfectly good hamburger and drowning it in condiments? Just look at that disgusting glob of mayo on the deluxe! No thanks McD's; I'll keep eating homemade. "Why do they insist on taking a perfectly good hamburger and drowning it in condiments?" Is it too much added effort for you to ask for it plain? New York was a test market for this new series of burgers so apparently there was no problem with the trans fat law. How about the bacon cheese info? You have the mushroom swiss on twice. emnik: Have you ever asked for something special at a McDonald's? Try it sometime. I once waited for a Big Mac with pickles and mustard only (for my sister, not me). It took 20 minutes and even then they didn't get it right. Changing the 'white balance' settings on your photo editing software would do wonders for the blueish-purple look of you burger cross-section. Can you special order one that doesn't look like it was made by a mentally retarded animal? You never told us what you thought of the meat. Not only is it shaped like all McDonald's meat (as you stated,) but it is virtually tasteless -- unless you like the excess taste of salt. Sorry, it was dry and nothing special. Not juicy at all. We will not order again. I gotta tell you...as a person who watches what he eats with much conviction....This was a delicious burger...unfortunately I will not be eating it again, due to the 790 calories and the 49 grams of fat ,along with the 2 grams of trans fat,,NOT GOOD for you!! !So as a healthy person who doesn't want his arteries clogged....I have to say Goodbye Angus!! I know for sure that Mcdonalds genetically modifies there food...the food isn't even real. ***These plants have been modified in the laboratory to enhance desired traits such as increased resistance to herbicides or improved nutritional content. The enhancement of desired traits has traditionally been undertaken through breeding, but conventional plant breeding methods can be very time consuming and are often not very accurate. Genetic engineering, on the other hand, can create plants with the exact desired trait very rapidly and with great accuracy. For example, plant geneticists can isolate a gene responsible for drought tolerance and insert that gene into a different plant. The new genetically-modified plant will gain drought tolerance as well. Not only can genes be transferred from one plant to another, but genes from non-plant organisms also can be used. The best known example of this is the use of B.t. genes in corn and other crops. B.t., or Bacillus thuringiensis, is a naturally occurring bacterium that produces crystal proteins that are lethal to insect larvae. B.t. crystal protein genes have been transferred into corn, enabling the corn to produce its own pesticides against insects such as the European corn borer. For two informative overviews of some of the techniques involved in creating GM foods, visit Biotech Basics (sponsored by Monsanto) http://www.biotechknowledge.monsanto.com/biotech/bbasics.nsf/index or Techniques of Plant Biotechnology from the National Center for Biotechnology Education http://www.ncbe.reading.ac.uk/NCBE/GMFOOD/techniques. Just tried the "Bacon & Cheese" version. Pretty tasty. Realized going in that this was likely to be a high-calorie, high-fat adventure. My burger actually looked better in presentation than yours in the picture (made at the "Rock & Roll McDonald's" in Chicago). All in all, a pretty good burger- and one that I would not mind having again...in a few months, since I tend to be pretty health-conscious. Thumbs up on this new product!